Everything about the hardware is top-notch, from the fast processor to the ultra-sharp display to the quad speaker system. The screen is large enough to make Apple's split-screen view practical. Two apps at once! 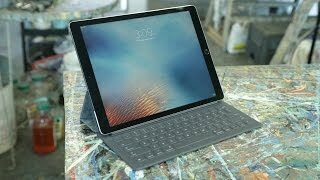 Add the keyboard cover and the iPad Pro can probably take the place of your laptop. The keyboard costs extra. The Apple Pencil costs extra. This is not an impulse-buy product. 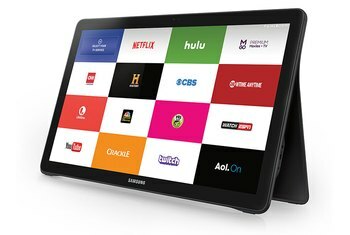 A tablet of this size can be uncomfortable to hold for long periods, making it a less appealing device for lazy-afternoon activities like reading and watching movies. There's an odd disconnect here: If you want a big screen and a keyboard, why not just buy a laptop? 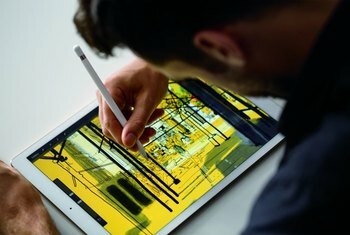 Talk about a tablet that can replace your laptop: Apple's biggest iPad to date spans 12.9 inches, bringing it close to, well, MacBook territory. With that in mind, Apple offers an optional keyboard, as well as an optional digital stylus aimed at artistic types. The iPad Pro has a big price, starting at $799 for a 32GB model and topping out at $1,079--accessories not included. If you’re using the iPad Pro to consume rather than produce content, it’s a joy. Video playback is butter-smooth and really shines on this display. I can see this being the perfect device to leaf through the newspaper or some comics with on a lazy Sunday afternoon, or a great replacement for those that spend hours in bed watching Netflix on a laptop. And it's not even that expensive... which feels like an odd thing to be saying about an Apple product (although you'll need to spend a little bit if you want the Pencil and Smart Keyboard too). f there’s a touchscreen revolution underway, it’s going to happen slowly, an app and an accessory at a time. That’s OK. The iPad Pro is a fantastic tablet, not to mention the first iPad in ages that has an obvious value next to our giant smartphones. It’s almost like you angrily ripped off the screen of a laptop and decided to pretend it’s totally normal to carry it around. That feeling of absurdity fades away as soon as you start to use it. So fundamentally, I know that the iPad Pro can’t do all of the things my MacBook Pro can do. ... I would still consider this a worthy runner-up to a laptop, or the one (non-smartphone) device I would take with me next time I travel — something I’ve never felt confident about before when it came to the iPad. 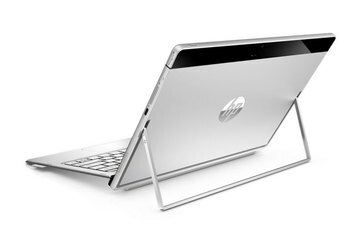 It’s the perfect digital coffee table book that just about doubles as a laptop. 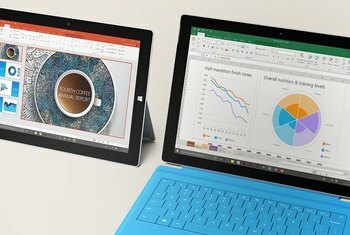 So long as you can get by with the app-based incarnations of desktop software like PhotoShop and Excel. You'd think a super-large iPad might feel absurd. But over time, it grew on all of us. It's beautifully made, and its extra space can be surprisingly useful at times. But it still wasn't a complete stand-in for an everyday computer for any of us...although it's priced like one. Even with a bigger screen and new accessories, the iPad still feels like a “sometimes computer.” I can take it with me on vacation instead of a MacBook and do pretty much everything I want, and I can even get quite a bit of work done on one ... 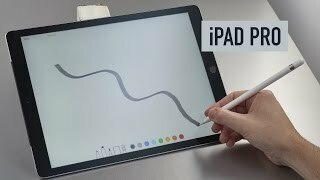 But what really does it in for me are the many small ways in which the iPad Pro is not quite a traditional computer and iOS is not quite OS X. For one thing, the iPad Pro is an amazing drawing surface. I've used and reviewed various tablet styli. None of them have the absolute accuracy that Apple's smooth, comfortable $99 Pencil does. Drawing on the tablet had zero lag and in fact felt superior to the Wacom Cintiq, which costs $799 just as a 13-inch display. And what of that keyboard? It's really too soon to put down a firm verdict, but tentatively, I like it. The cloth-covered keys feel nice beneath the fingers, and help give the illusion of control, despite the fact that these are otherwise some fairly flat buttons. Once you have it propped up just how you like, the iPad Pro’s screen looks amazing. At 2732x2048 resolution, it’s got 5.6 million pixels, and the short side has as many pixels as the longer side of an iPad mini. I was impressed with the responsiveness of iOS 9 on this tablet, as I easily pulled out the sidebar and entered Split Screen view. 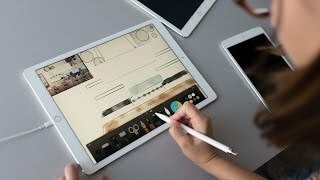 Apart from its larger size, the iPad Pro is virtually identical to other iPad models, with the same placement of its Touch ID Home, power and other buttons. One very noteworthy difference, however, is that Apple has finally caught up with certain other tablet vendors in using multiple speakers. It's light enough to hold one-handed, though you get better results if you cradle it in your arm like a clipboard. Looking at the display for the first time is much like seeing an iMac with 5K Retina that first time: the colors are bright, viewing angles vast, and the whole thing generally astonishing. But, for me — a person already using his laptop a lot less in favor of the iPad — the Pro is just not likely to eliminate my laptop use entirely. And I say that knowing that, for instance, there will be better keyboard covers and cases. 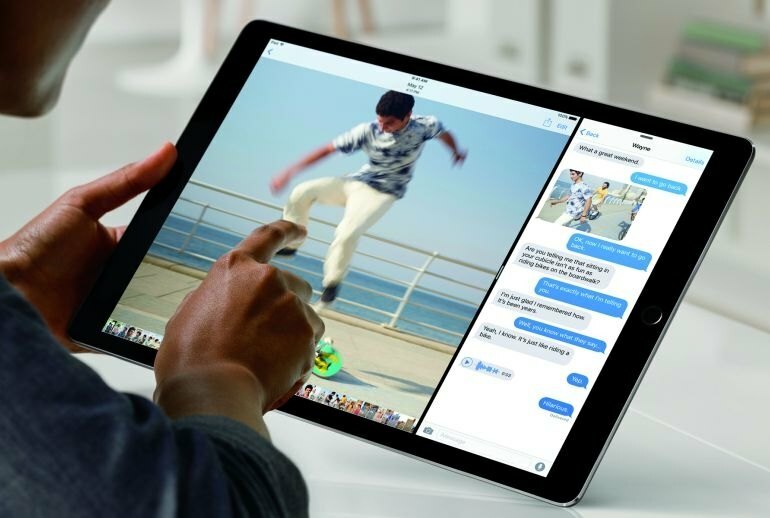 Apple has placed speakers on each corner of the iPad Pro, the first tablet with four speakers. You'll hear bass from all four, with the high and low range sounds coming from the speakers on the ones on the top. In a clever trick, which speakers are on top changes with the orientation of the iPad, so you're assured of consistent sound whether you're watching something in portrait or landscape mode. 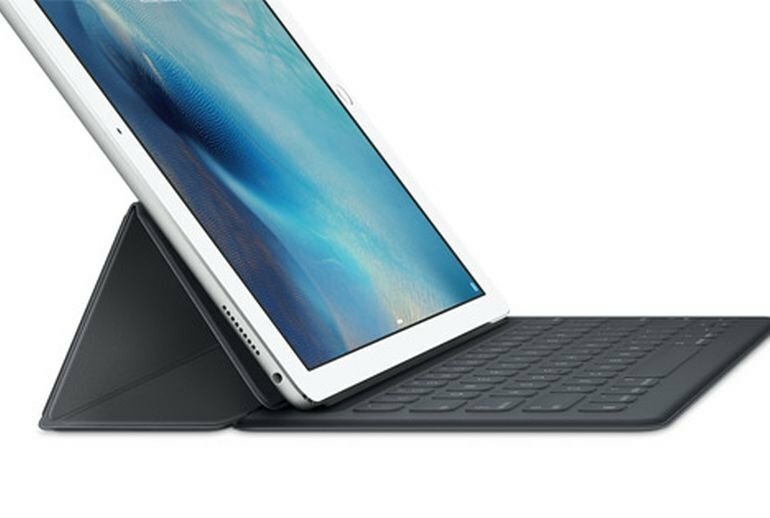 The iPad Pro is Apple’s attempt to turn its once-blockbuster tablet into a much bigger deal. Literally. After a week and a half of testing it, I can say Apple has done that. I honestly like the iPad Pro, but not because I have so much screen real-estate. I like it because I could use it to get real work done. This 1.57-pound, 6.9mm-thick device is a little clunky, sure, but it’s entirely possible to hold in one hand. 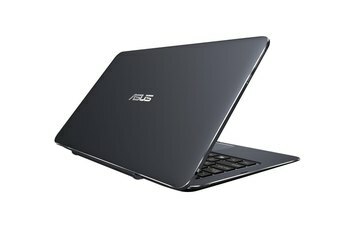 It’s sturdy and handsome, with speakers on all four corners and the same rounded-rectangle feel as its smaller brethren. It’s just enormous. I can’t say that enough. Many users have had their iPads on laptop duty for years, but the iPad Pro is the first model that feels to us as though it were designed to supplant a PC.